I apologize for taking a bit to get the final entry out, but I would like to relive some of the moments on the trip. 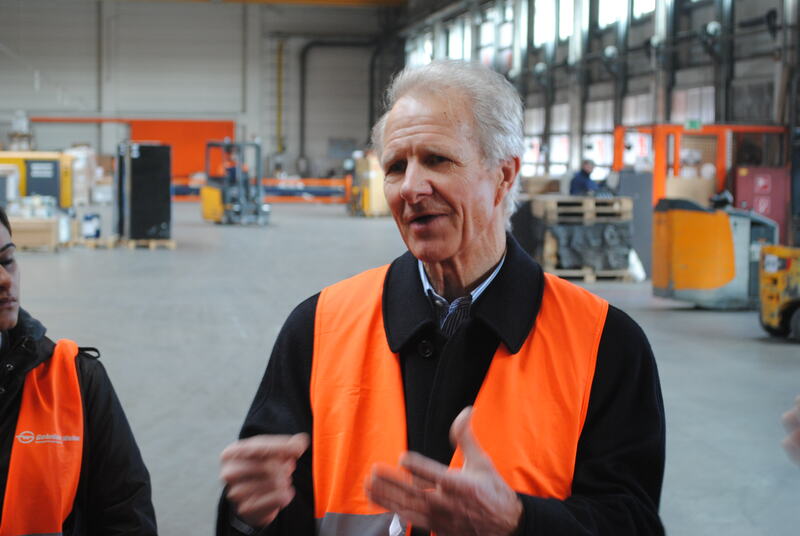 We saw a lot of family businesses over our time in Austria, from a waste management/recycling company to a multi-national distribution and logistics company. The trip really makes you think about how different the perspectives can be in a business. Especially in a family business, the culture, attitude, and process can usually be attributed to a single person. Personalities can range from an “overbearing father” type of CEO, who keeps tight control over the firm and drives decisions, to a more team-based leader, who will defer to the general consensus of the board. These personality ranges in the manager/family owners really do make each company unique in its structure. I will admit, my preconception of a family business leader was that of an independent decision maker, who led with a firm conviction. But this trip has taught me that, in preparing for the success of future generations, it is important to include the family in a large portion of the decisions of family ownership. Thank you to Jennifer, Roberta, and Michael Preston for making this such a memorable trip. I hope they do a similar trip for the family business people of CBS in the upcoming years. Vienna Days Two thru Four: Take it to the BauMax! These last few days have gone by in a whirlwind for our group. We have toured and experienced (8) different companies. This has led to a lot of lessons learned on both the family and business side of things. I will attempt to provide a solid overview of a couple of our visits and the lessons learned. I will also attempt to not be boring. We toured the U.S. equivalent of the Home Depot/Lowe’s chains in Austria. BauMax is a family owned construction/home improvement supply and garden center. The founder of BauMax, Mr. Essl, opened 10 store chains in Austria by himself in 1976. This company has thrived through two main ideas: economies of scale and historical macroeconomic events. BauMax achieved economies of scale by being a first-mover in the home supply market. They rapidly expanded to 67 stores in Austria, and have also expanded internationally. They use a strong mix of local suppliers and international suppliers to gain a cost advantage over their competitors. BauMax has also benefited greatly from the fall of the Iron Curtain. In the 1990s, they expanded into the Czech Republic, Hungary, Slovakia, and Slovenia. The fall of communism in these areas allowed foreign entities to move in: essentially the new “Wild West” market. Our BauMax host, Alexander, reiterated how a being a family business was a big advantage for BauMax. First of all, they were able to move quickly into new markets because Mr. Essl made the major decisions. They didn’t waste time with shareholder votes and a complicated due diligence process. Another advantage was that Mr. Essl made decisions that were right for the long-term survival of BauMax. He placed emphasis on timing the right expansion, rather than growing yearly earnings. The final advantage of being a family business seemed to be in “walking the talk”. While the company expanded into new countries, the local foreign newspapers were trying to dig up dirt on Mr. Essl. However, because he carried his family values to his business and lived modestly, Mr. Essl was able to gain the respect of the local people and avoid bad press in the new countries. Okay, maybe that was a bit analytical (boring). 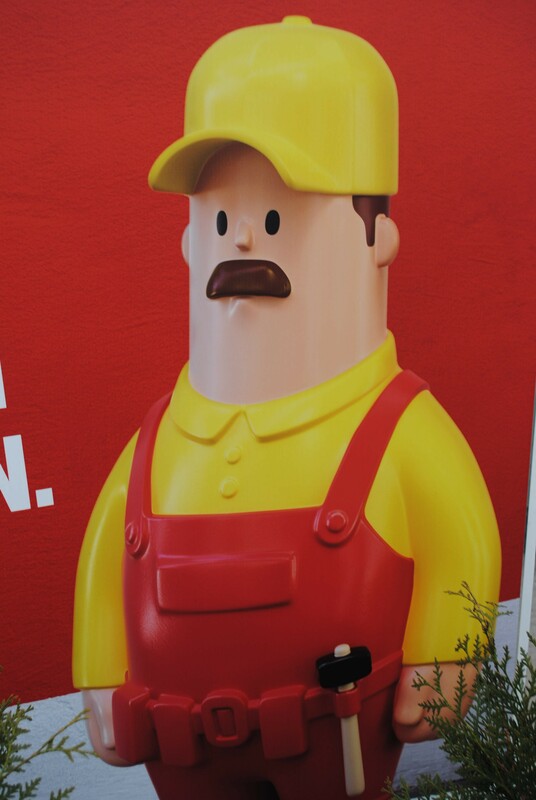 Hey, here’s a cool thing: the BauMax mascot is a construction worker without a chin. BauMax mascot. I think he may be related to Beaker from the Muppets. This was a really cool firm. Gebrüder Weiss is a logistics, transport, and freighting company that has been around for 538 years. Yes, that is a long time. They were around before America was a known thing. The other crazy part about this company: they have been a family business for all of that time. With a tradition this old, I can only imagine the enormous pressure that the children in the company must have felt over the years. I can picture in my head one of the fathers passively aggressively talking to his son/daughter about the future, “You know, our 1 billion Euro company has been around for 17 generations…but sure, you go ahead and audition for American Idol. I’m sure that will be the most rewarding move you will make in your life.” Of course this would have been relayed in German. Paul Senger-Weiss talking to CBS students about how his family business operates. 1. Organize and plan succession early and openly. Perhaps another bit of very useful advice that came out of our meeting: Never form 51% to 49% partnerships. Either structure a partnership to be 50/50 or a proportion that is much larger. A proportion that is so close breeds resentment, and often ends in loss for both sides. I wonder if the show American Idol will last for 500+ years. Probably not, thank goodness. Vienna Day One: A Visit to the Candy Factory! In the real world, the Manner factory is much more productive and clean. 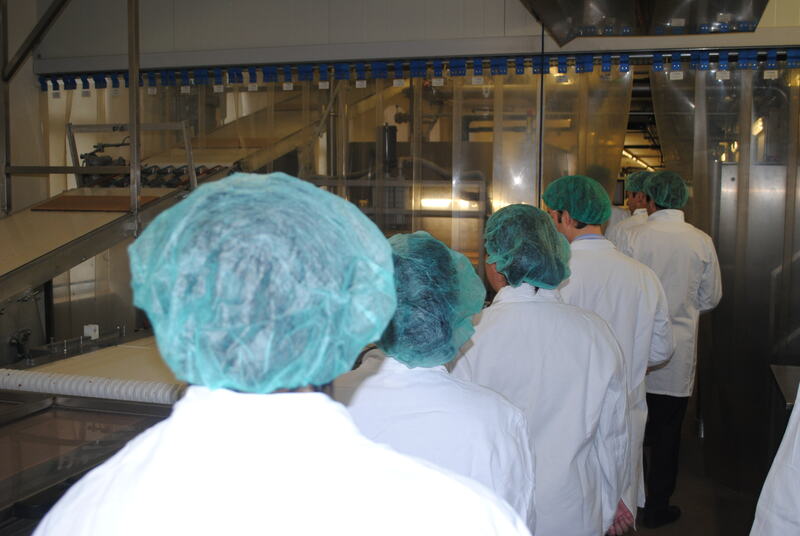 CBS students in hairnets getting a tour of the Manner factory wafer production line. 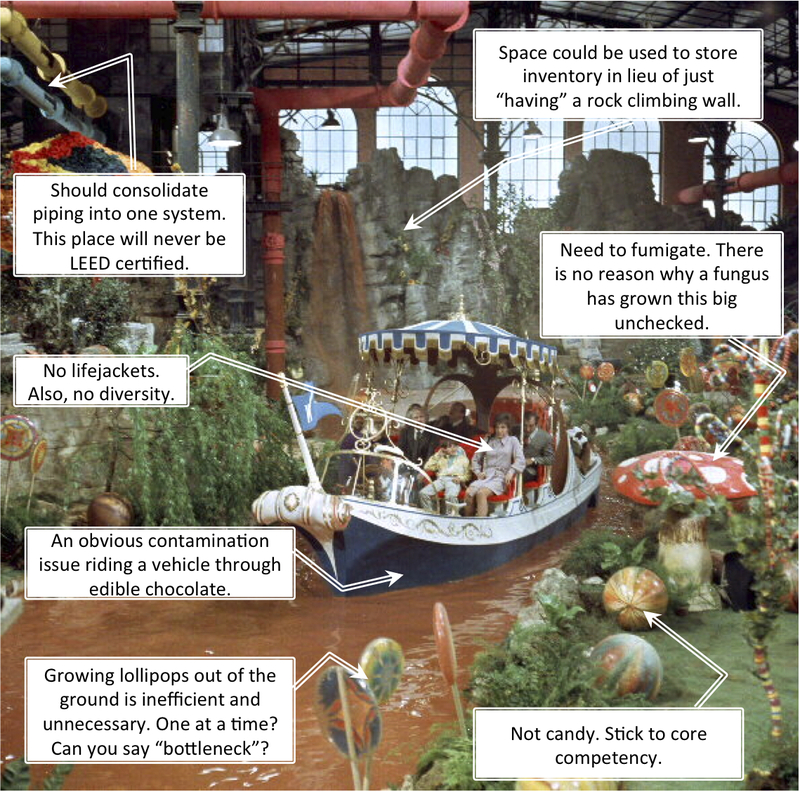 I should also mention that the Manner Corporation is much more than just a candy manufacturer. In fact, their most popular product is a hazelnut filled wafer cookie. These Manner Wafers are quite tasty, and received product placement ads in movies such as Terminator 3 and TV shows such as Friends. Our group was led by Mr. Hans Andres and was taken around the production line of the wafers. The best part of our tour actually came near the waste bin. 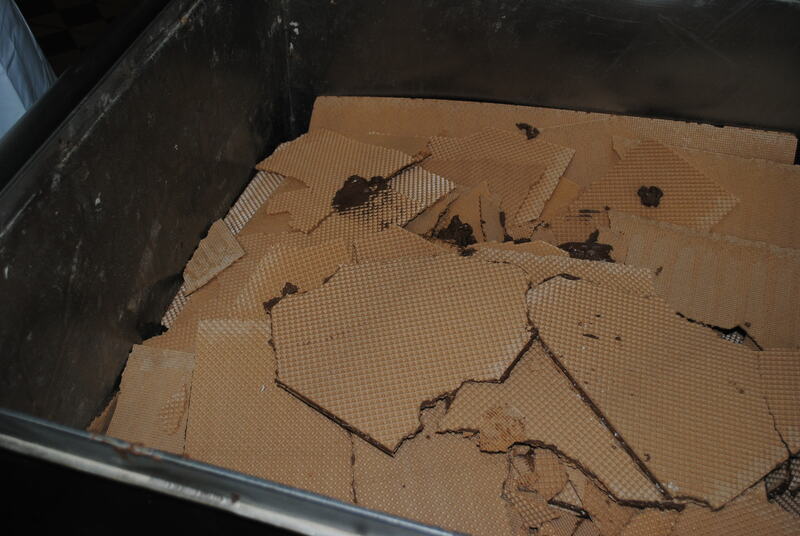 Wafers that are damaged in the cutting process are disposed, but are actually still quite delicious. This led to the first dumpster diving that I have ever done in my life. 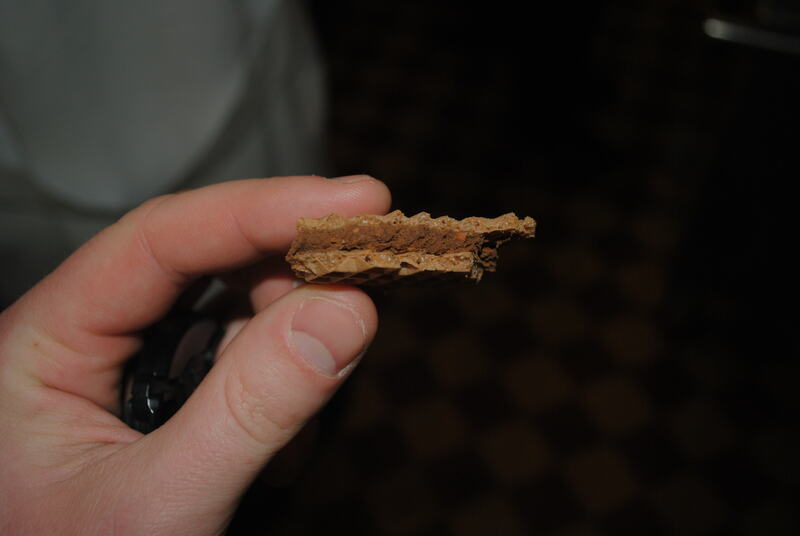 Wafer cross-section of a broken batch. The interior is a hazelnut chocolate filling. What is most interesting about the Manner Corporation is its successful merger with Casali-Napoli in the late 1970s. This merger combined both the companies and two different families: the Manner and the Andres families. Mr. Andres spoke to us about how difficult it was to unite the two companies. Even after 17 years, there were still remnants of the rivalry that once existed between the two families. He mentioned that the problem was solved by open communication with all employees. He felt that being open about the company goals united the firm and helped to dissolve the past tension. Mr. Andres also stressed the importance of having non-family member board members present, to keep an objective eye on how the business is progressing. The non-family board members were able to effectively recognize the tension and communicated to both families how important it would be to change the attitude. Ultimately, this led to a more integrated company which deals with conflict in a more productive way. We really enjoyed our time at the Manner company, and can’t wait to see what else the week has in store. We have arrived in Austria. It is a country that is rich in culture and tradition. Of course we are excited about all of the stereotypical Austrian delights: skiing, the opera, the birthplace of Mozart and Arnold Schwarzenegger, and of course, the food! Yes, our professor has not stopped talking about the legendary Sacher Torte, a pastry created at the renown Sacher Hotel. The treat is a rich blend of chocolate frosting, three layers of spongy chocolate cake, and a thin layer of apricot jam along with a side of whipped cream. While the pastry is a sufficient reason to visit the hotel, we are going for a different reason: the hotel is family owned and operated. We are taking this trip as part of a Global Immersion in Family Business course at CBS. Our group is visiting Vienna and Graz to get a closer look at Austrian family businesses and how they operate. In Europe, over 60% of enterprises are family owned. In Austria specifically, there are many companies that are in the 4th and 5th generation of family ownership. This length of ownership is quite a feat- approximately 65% of family businesses fail during the 2nd generation and 87% fail during the 3rd generation. During our time here, we are hoping to gain insight on best practices to maintain a lasting family business. We are also looking to learn about the cultural differences between European and American family enterprises. We have a packed schedule, but we will try to squeeze in a few local activities as well. And we will certainly be having a Sacher Torte.